SCENE 41. Barry marches with the Prussian army, somewhere in the morass of the Seven Years’ War. 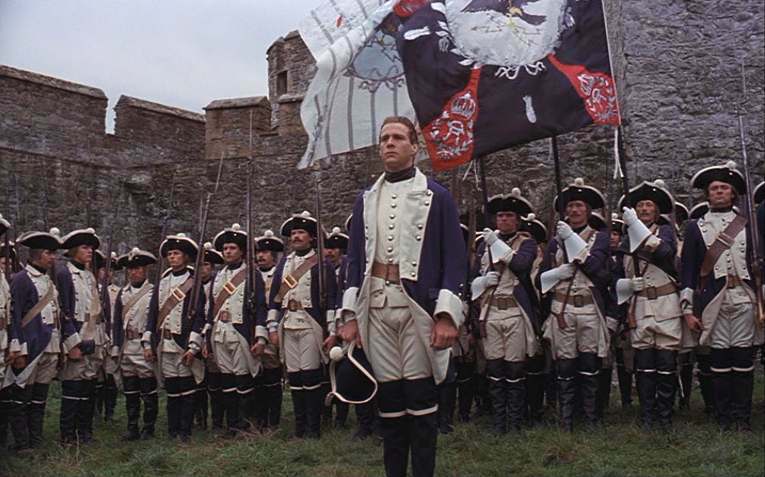 For the fourth time, the narrator tells us that European armies in the war were made up of criminals and thugs, and now informs us that Barry has fallen into bad company and become a criminal himself. Again, Kubrick doesn’t dramatize any of that, he just shows us Barry’s face as one of many in a column of relative misery. Barry, once a cog in the British war machine, is now, apparently, something worse. SCENE 42. 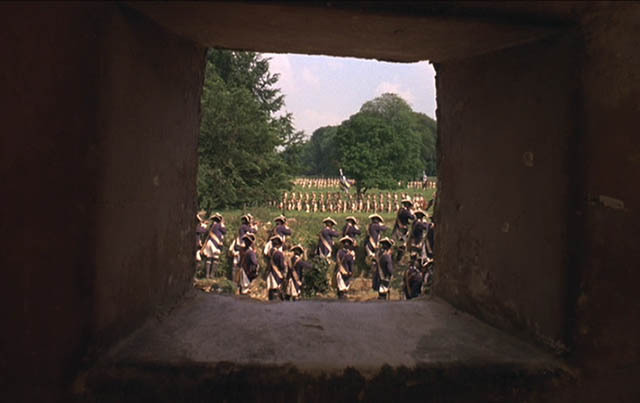 Act III of Barry Lyndon now presents another battle sequence, in more or less the same position as the one near the top of Act II. This one is not the mind-boggling two-rows-of-soldiers-marching-at-each-other kind, but a more conventional “siege” scenario, with whoever is fighting the Prussians advancing on a building held by the Prussians. What the battle is about, and, indeed its outcome, is not mentioned. Barry is in the building with other riflemen, shooting at the enemy from a position of relative safety while Potzdorf tours the battle scene. 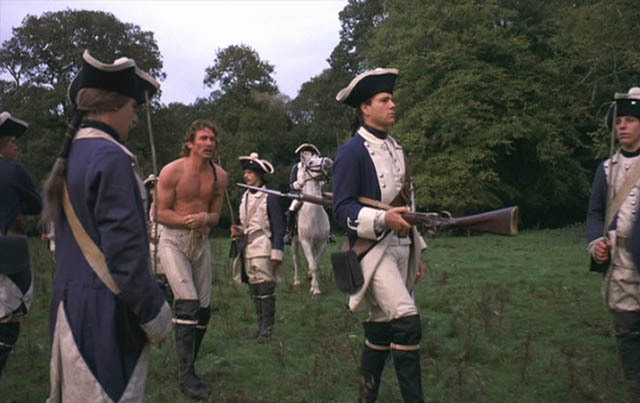 Potzdorf may be a “bad father” to Barry but Kubrick goes out of his way to give him a sympathetic few shots, holding his camera on him as he tours the battle, something he does not give to Grogan. Does Kubrick think that Potzdorf is a cannier leader than Grogan? Wiser, wilier, better in battle? Or is Potzdorf’s tour of the battle just a way of explaining how he ends up in the house? In any case, as soon as Potzdorf arrives at a safe vantage point in the house, the enemy fires a cannon shot that brings the ceiling down, and a beam on top of him. The other soldiers flee, but Barry stays to rescue Potzdorf. Why? That is, what’s in it for Barry to rescue his Prussian captain? The scene is, again, a mirror of the earlier scene with Grogan, where Barry comforts his dying friend and authority figure. We could say that Barry, given a second chance, rescues his “bad father” to make up for not being able to save his “good father.” But it could be something simpler, it could be merely that, in a moment of crisis, a moment of violence at that, Barry shows that he is, at this point in his life anyway, a fundamentally decent man. SCENE 43. As a reward for saving Captain Potzdorf’s life, Barry is given a (small) reward by Potzdorf’s next-in-command, a stern colonel who can’t let the pittance go without first telling Barry that he’s a terrible person who will never amount to anything. If Potzdorf is Barry’s father-figure, this colonel is Potzdorf’s. But his upbraiding of Barry comes from out of the blue, even though the paternalistic disappointment on his part is palpable. 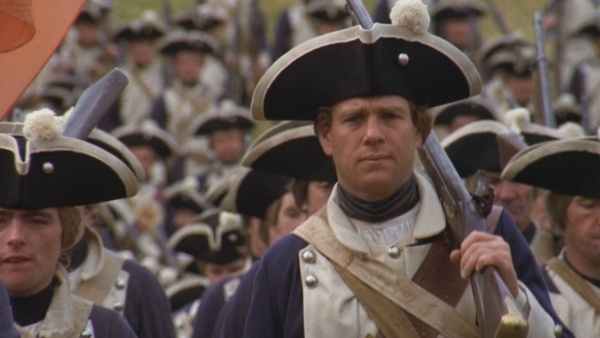 I think a stronger scene would be Potzdorft criticizing Barry himself, but the script needs him to bring Barry into his trust soon, and so Potzdorf’s disapproval is shifted onto this colonel who pops up from nowhere and is never seen again. In any case, Barry defends himself by assuring the colonel that he would do anything in service of the regiment. Personally, I doubt that Barry is sincere, but at least he’s learning how to lie better. SCENE 44. 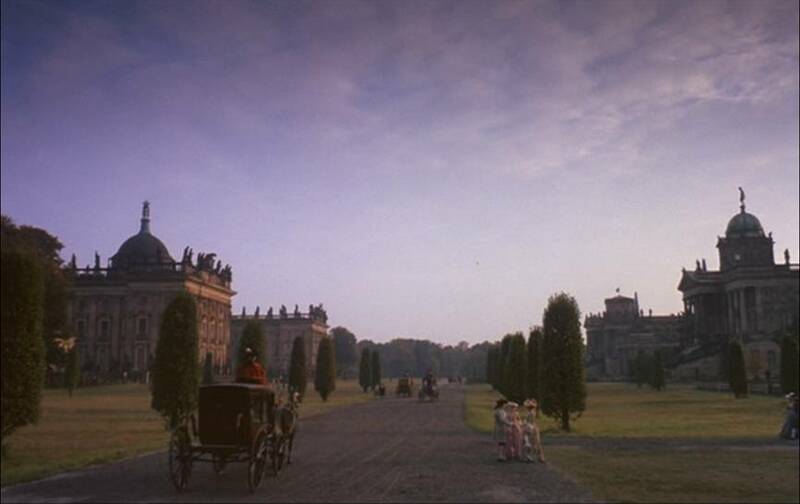 A brief, gorgeous establishing shot (there are no other kinds in this movie) of the royal court. The narrator informs us that the war has ended and that Barry has accompanied Captain Potzdorf to life at court. While Barry’s rescue of Potzdorf remains mysterious in and of itself, once he’s gained favor with Potzdorf he takes the opportunity to ingratiate himself to him. The point being, obviously, that Barry still seeks social mobility but has learned enough by now that advancement, for him anyway, depends not on love but love’s counterfeit. Love has garnered Barry nothing in this life, but pretending to love has its benefits.